They say it never gets lonely at the top. In the entry level sportsbike segment the R15 was the undisputed king till the CBR250R came along. Being the more focused machine among the two, the R15 remained king of the ring and gave a lot of youngsters the chance to enter the motorsport scene. Then came the KTM 200 Duke and made the R15 feel insecure with its manic temperament and never-before-seen styling. Now there's yet another rival in the arena. It is Honda's attempt at eating some of the R15's pie. Say hello to the new Honda CBR150R. The R15 has been around since 2008. Even when the motorcycle had a midlife refresh last year, Yamaha decided to work primarily on the rear end. This means the bike still uses a four-year-old front end that we are all too familiar with. But this does not mean that the Yam is a bad looking motorcycle. It is one of the edgiest and most aggressive designs in the market today. The aggression is carried over to the rear as well with the version 2.0's R6-inspired tail section and split seat. The CBR is a fresher package with the VFR-inspired styling which has been carried over from the CBR250R but has undergone some minor changes. For example the plastic around the headlight has a small dip right in the middle, there is a shorter stubbier silencer and completely new graphics. Talking about colours, the CBR gets some very interesting options with the flagship orange and white, a green and black, a white and black as well as a red and white paint job. The R15 meanwhile opts for the tried and tested blue, red and black colours. There is also a very interesting red flame paint job and a 50th anniversary red and white livery that is now on offer. Both motorcycles are evenly matched in the build quality department and come with their own sets of flaws. The CBR for example has the same switchgear from the CBF Stunner and lacks an engine kill switch and a pass button. The R15 on the other hand does not have grab rails for the pillion which considering the high, split seat is a bit of a concern. Both motorcycles use electronically fuel injected, liquid cooled four stroke engines that are 149.4cc (Honda) and 149.8cc (Yamaha). While displacement is pretty much similar the difference is in the bore and stroke. The CBR150R has a bore of 63.5mm with a stroke of 47.2mm. The oversquare layout of the engine points to a very high revving unit that makes its peak power of 17.82PS at a tall 10,500rpm. The R15 on the other hand has a bore and stroke of 57mm and 58.7mm. Unlike the Honda the R15 makes its peak power of 17PS at a very accessible 8500rpm. While you can argue that the high revving characteristic of the CBR makes it perfect for the racetrack, let's face it - not many of the people who buy the CBR will use it extensively at the track? The R15 with its powerband resting around 8500rpm makes for a much more usable motorcycle in real life. The difference becomes even more apparent when you look at the torque figure of 12.66Nm that the CBR makes against the 15Nm that the R15 makes. The R15 even makes its peak torque at 1000rpm lower than the CBR. In real life this translates to fewer gearshifts and hence a more relaxed ride. In our performance runs the R15 managed a 0-100kmph run in 13.07 seconds while the CBR took 13.23 seconds. While the difference might not be much, the way the R15 delivers its power is where the difference lies. The moment you drop a gear the Yam instantly responds, making for a very involving ride. The CBR on the other hand feels sluggish and lazy. Coercing any kind of urgency from the motor is a task in itself. You need to work the gearbox and rev it right till the end to make it go quick. Ride it hard enough and you can post a quarter mile time of 18.62 seconds which is only marginally worse than the R15's 18.25 seconds. And it is not just in acceleration, even in our top speed test the R15 emerged victorious with a max velocity of 131.7kmph (130.74kmph for the CBR). So far, the R15 has managed to best the CBR at everything from the fun factor to top speed and acceleration. But the one area where the CBR wins hands down is in engine refinement. Where the R15 is quite smooth though loud at higher revs, the CBR is a typical Honda  silky smooth. And it is not just in refinement that the CBR wins. The Honda is way more efficient than the R15. It returns 67.5kmpl on the highway and 44.8kmpl in the city making for an overall efficiency of 50.5kmpl. The R15 on the other hand returns only 53.4kmpl on the highway and 36.3kmpl in the city. This is a difference of almost 10kmpl in overall efficiency. One of the most striking differences between the two motorcycles is in the way they handle. We tested both motorcycles in wet conditions so traction was at a premium. The very first thing you will notice is that going into corners, the R15's front end feels more planted. There is more confidence going in and coming out of corners. Especially in exits you don't have to keep the revs at the limiter to accelerate out. The CBR on the other hand feels front heavy and you cannot throw it into corners as easily as the R15. The fact that the Honda uses a 100 section tyre in front as against the 90 section tyre on the R15 is one of the reasons for this. Also, like Shumi said in the road test last month, there just isn't enough grunt to power out of corners and make a quick exit. Another point to be noted is the difference in tyres. Most entry level sports bikes in India now come with soft compound rubber. The first-gen R15 set the standard for this with its super sticky MRFs. The version 2.0 continues this tradition. The CBR however opts for more durable harder compound rubber from MRF and this hinders its handling a great deal. Especially in wet conditions, you can feel the tyres losing grip and almost washing out at the slightest hint of lean. So, where the R15 goes flying through corners in the rain (not as fast as it would have in dry conditions, but fast nonetheless) the CBR gets left behind. The lack of grip is evident under hard braking as well. Where the R15 takes 16.69m to come to a halt from 60kmph, the CBR takes 18.63m even though both use a 276mm disc at the front and 220mm at the rear. This is not only due to the fact that there is not enough grip in the tyres, but also because the CBR's brakes lack the kind of bite that the R15's have. The CBR however is not sprung as hard as the R15 is. This means that the Honda has a suppler ride and will not rattle your bones like the R15. This, added to the fact that the R15 has a way more aggressive riding position, makes the CBR a very comfortable bike to ride. On the other hand the softer setup will mean that the Honda will not be able to keep up with the R15 when ridden right at the limit. Of course, we will only be able to say this with authority once we unleash them at the racetrack. The CBR150R costs Rs 1.27 lakh while the R15 costs Rs 1.25 lakh (both ex-Mumbai). Both bikes look good, even if the R15 is a bit dated. The build quality too is pretty much the same. When it comes to performance however, the R15 is clearly the winner. It accelerates harder, goes faster and corners better. The CBR150R on the other hand is more efficient and more comfortable to ride. Sadly for the CBR, these are not qualities we look for in a sportsbike, whether entry level or not. 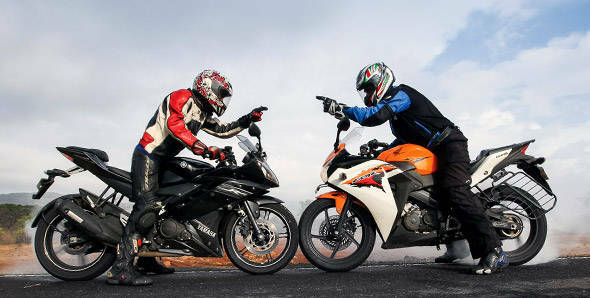 So essentially, if you buy an R15 you will have a quicker, faster, better handling bike for Rs 2,000 less than the CBR. A good deal if you ask me.